We produce a huge range of custom printed stickers to suit the specific signage needs of our customers. Our products are suited for many indoor and outdoor applications-industrial, commercial, Window Stickers and floor retail stickers. Our window stickers are custom printed on a full colour removable white vinyl. The end product is masked using a laminator so you have an easy time applying to your windows in a straight fashion. Whatever your art or message, and however you may like it cut-out, we know you will love this product. You can choose from standard or custom shapes and order them in any size to suit your taste. Order from one sticker to hundreds of thousands. No job too small or large. Floor stickers are excellent and very attractive marketing tools if you have any unused space on floor of your business premises. 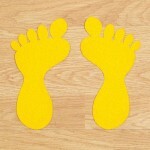 You can advertise your business with floor ads stickers. Wild Cow Visual offers high quality digital printing of floor decals with anti slip lamination with no limited to colours, size and shapes for floor decals. Wild Cow Visual is based in Sydney but we ship all our window stickers and floor stickers to anywhere in Australia, including Sydney, Brisbane, Perth, Adelaide, the Gold Coast, & Canberra! Order today for your business in Hobart, Sunshine Coast, Wollongong, Townsville, Bendigo, Darwin, Alice Springs, & Newcastle!